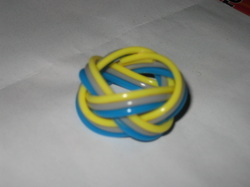 Sample Woggle made from three colours. Simple instructions passed on through countless hands, but originally from 1st Newport Cubs. For a youth sized scarf a 20mm dowel is suitable. Download the PDF which is a single A4 page with diagrams. With some help to get them started cubs can easily make one of these. A dot of glue is required to hold the ends in place. 1 metre lengths of Scoubidou are ideal.